The first time I had potato soup, I was eating it in a flight, so let’s just say it did not leave the best impression. 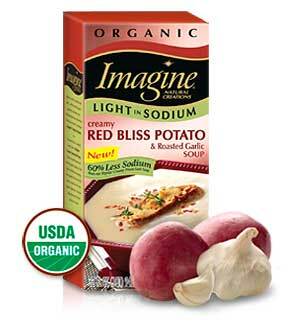 I wish they would have had Imagine Natural Creations Red Bliss Potato & Roasted Garlic Soup. It’s low sodium, but not low flavor and it only has 90 calories per one cup serving. It does not taste like it is gluten free or non-dairy. I almost felt guilty about taking it easy, catching up on my books and eating my tasty soup. Almost. The Soup Diaries. Day 1. I didn’t think about it much before now. Maybe a cold soup or one made with fruit or something but not usually in the Summer. This experience is making me think about it, though. How well does it do with add ins? I can’t eat just plain tater soup….I need some cheese and bacon. It does well with them. It has enough flavor to stand on its own or complement extras.